Thanks again for your help Paul ! But after watching the test , i am not that convinced by the technic. But the test post , has this fume fx aspect , kinda too swirly that feel unatural to me , sur it looks nice , but like marty say going higher in res should give you better outpout. Yes, just pushing the solver resolution often seems to be the best bet. What Jerry says in his post about using advection in a fraction of a step, rather than across multiple steps, to give the sim an extra bit of smoothness makes a lot of sense. Use it as a bit of extra seasoning, not as your main ingredient. Exactly Julien ! you are very close but still not enough detail. a - Did you push your container res ? b - Do you use a post - process op like gridless advection ? in case b i would be happy to see a little playblast , cause those post process tricks often introduce some weird stuff in the sims ? It's pretty much just a standard upres. 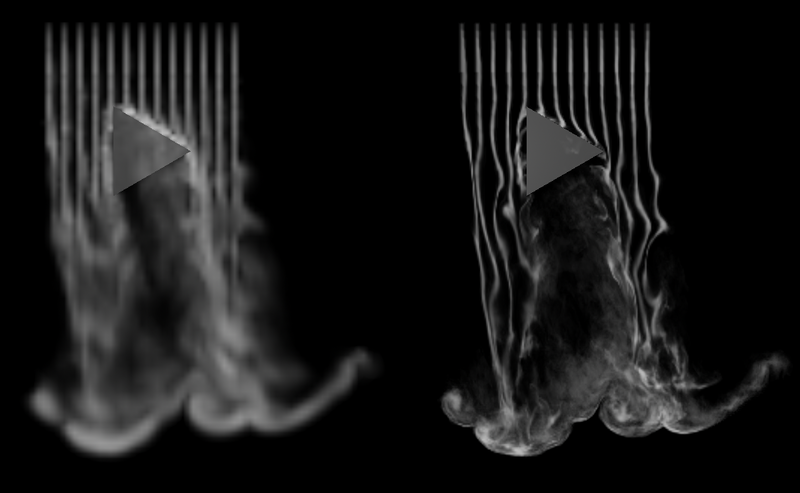 In the upres sim, I multiplied the density field's divsize by 0.4 so there is even less detail loss from advection. This is quick to sim, so I could push the res a lot more. I didn't take any time to add diffusion since it's very tricky, but I boosted the low density values in post, that helps keep the very thin density. I pushed the res a bit more: lowres: 0.07 , upres: 0.0175, upres density: 0.007 and it looks sharper when rendered. Upres is definately a good option I think, the lowres sim runs almost real time so you can get quick feedback. That looks really better Julien ! would it be possible to share a simple hip that describe how you do your up-rez ? like the wavelet - turbulence process ? 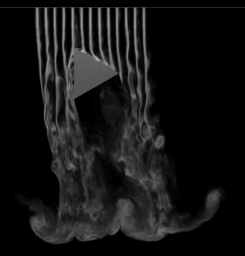 i'm just afraid that the fluid doesn't look to slide on the pyramide. gasupres DOP yes, you can even get it from the shelf tools. You have to make sure the "curl" values are re-mapped (ramp) on the edges of the smoke, just turn on the visualization tab. 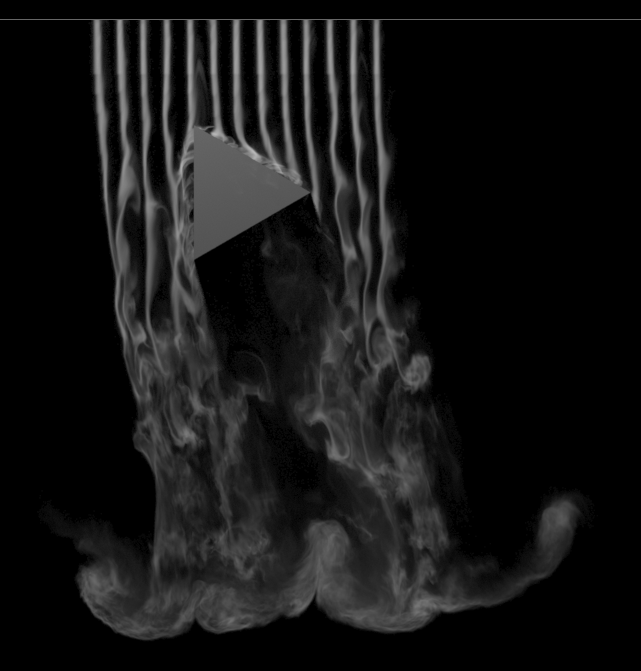 The collisions are only as good as your lowres sim so if the smoke doesn't slide perfectly, you can control the velocity near the collision boundaries. you get a nice SDF field for free: f@collision, the values are inverted though, negative values outside. I used it to add extra disturbance near the collision. Also there is no need for temperature. I'll try to render and create a HIP if I have time tomorrow. Can anyone provide an example file using the Gas UpRes node? The help card is incredibly long but there is no example file provided by SideFX. Very informative ! and i really like this idea of paying the "paté" price and get "foie gras" instead ! 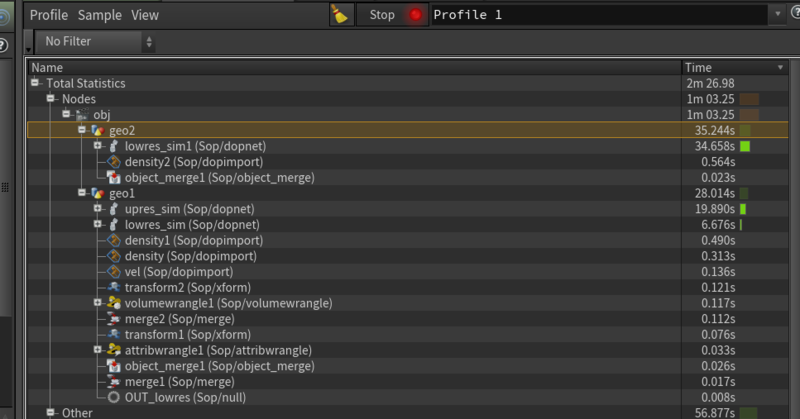 The update sidefx did to the help style seems to have vanished a lot of the examples. Thanks for the example file, that helps a lot. I disabled a few things in DOPs (caching turned off, no rest, no temperature, ...) and ran the sim with Hbatch. 60 frames sim in 10 mins 20s, including the lowres, max RAM 5.2GB. Have fun with your sim! Hi, thanks for great example. How would you simply describe how upresing works? The only thing that is needed from low res sim is vel field and source. Is it basically advecting higher resoultion source density with low res vel field? And adding turbulence to upsampled vel field to introduce smaller detail. (with high frequency so that overall shape is the same). So if I understood it right then it is the most efficient way of doing simulations? Because the most computation heavy tasks are non divergence projection and advection. And if divergence projection is computed on low res sim then it is quite optimized workflow. density is sourced into a hires field and advected using the hires vel - the projection is done in the lowres sim. It’s a much more efficient way of working but it requires a good looking lowers sim first of course. You’ll also need a lowers density field for the upses to work if you’re using density to remap the turbulence. it's not divergence free but the amount is negligible. On this topic - what is the difference between using "Make Collide" and using "Static Object" for a pyro sim? I really have to bump this thread - I found this particular example of the up-res-setup to be one I will be using in any pyro I do from now on I think. I think it's amazing! Also played around with comparing it to a sim that is the same size as the up-res initially. The up-res-method has a speed gain of about 30% from my test. The file is attached! That's the compare after 100 frames. Geo 2 is the sim that is high-res initially.